Eva Mae Brooks, 87, of Louisville, Kentucky, passed away on Thursday, November 29, 2018. Eva retired from The Bank of Louisville after 30 years of service. 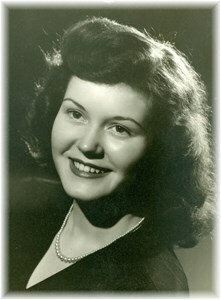 She was born on March 18, 1931 in Nabb, Indiana to Berlin and Fannie Graves. She is preceded in death by her parents, Berlin & Fannie Graves; husband, Henry Brooks, Jr.; and brother, Kenneth Graves. Eva is survived by her children, Tom Cox and Terri Cox; grandchildren, David Cox and Amanda Potts (Steven); great-grandchildren, Caroline Potts, Jill Potts and Braxton Cox. Visitation will be from 4 pm to 8 pm on Monday, December 3, 2018 at Newcomer Cremations, Funerals & Receptions East Chapel (235 Juneau Drive, Louisville, KY 40243). A funeral service to honor the life of Eva will be held on Tuesday at 11 am at the funeral home, with entombment to follow at Resthaven Memorial Park. The family requests that contributions in Eva’s memory be made to Hosparus of Louisville. Add your memories to the guest book of Eva Brooks.